Want a remedy to feeling happier and rejuvenated? Massages provide a variety of health benefits, relieve stress, promote relaxation, treat pain, and aid in rejuvenation. With over 200 types of massages available, you may not be certain which treatment is the best for you, but remember to focus on your specific needs and preferences when making your selection. When you hear the word “massage,” chances are you’re thinking of the Swedish massage. This type of massage consists of three different strokes. Effleurage is the name for the long, sweeping stroke technique that normally starts and ends the massage. The masseuses’ fingers, knuckles, or thumbs may be used to apply friction. The second is petrissage, which involves kneading the muscles in rolling motions. Lastly, tapotement uses fast movements like chopping or pounding. However, not all places use tapotement because it may not be relaxing for everyone. The Shiatsu massage originated from Japan and uses stretching and finger pressure in rapid, rhythmic sequences following pressure points for 2-8 seconds. It is designed to fix imbalance within the body and has origins traced back to healing procedures. Its intention is to improve circulation, relieve stiff muscles, and remove stress from the body by calming the nervous system. Probably one of the most “interactive” bodywork treatments available, the Thai massage incorporates yoga-like stretches that the masseuse aids in forming. The idea is to feel refreshed and invigorated resulting in an increase in energy levels, increased flexibility, and overall health being. Just a heads up: the masseuse can (and will) use every part of their body to get the full effect and in some sessions, you might even be walked on. This massage may leave you feeling a bit sore because it aims at applying a firm and deep amount of pressure onto specific areas. The masseuse will use knuckles and elbows to “strip out” muscle tissue as close to the bone as possible. This massage generally helps athletes who work their bodies intensely, people with dense tissue, and people who are undergoing physical therapy to breakdown scar tissue. A feeling like no other! Using heated, smooth, round stones, the masseuse will place the rocks on certain points of your body to warm and simultaneously loosen muscles that are tense and tight. The massage therapist may even use the stones themselves to apply pressure to your body to relieve muscle tension. Athletes know that physical activity can result in soreness, tired muscles, and even painful injury. The sports massage combines Swedish, Shiatsu, and other massage techniques to specifically locate areas that may be affected by your particular sport. Sports massages allow athletes to prepare for performance, and prevent and treat injury. It is especially beneficial for reducing pain and relaxing muscles to reduce anxiety levels. Designed specifically for expectant mothers, the prenatal massage is safe for both mother and baby. For optimal comfort, cushions are placed beneath you. This massage is definitely great for pregnant women to reduce their stress, remove pregnancy discomforts such as backaches, stiff necks, leg cramps, headaches, and edema (swelling). If you suffer from headaches, muscle tension, fatigue, and other aches and pains during or as a result of pregnancy, this treatment may be the one for you. Experiencing tired, aching feet because you’re standing up or walking all day? Reflexology may be the treatment just for you. Also known simply as a foot massage, reflexology equips the use of pressure on certain areas of the foot, which correspond to systems and organs in the body creating a relaxing feeling. Filled with heavenly scents of plant and essential oils, this massage uses select oils to relax, energize, balance, and even reduce stress to stimulate your entire body. This is a great massage with an emotional component. For example, one of the most common essential oils used is lavender, which allows you to “reset” and feel relaxed. If you’re suffering from injury or are experiencing post-surgery pain, the Lymphatic massage is highly recommended for its proven swelling reduction properties. Therapists use a light, gentle stroke that is repeated over and over to stimulate the lymphatic system and decrease edema. Next time you’re looking to de-stress, put the glass of wine down and opt for a new experience: a massage! 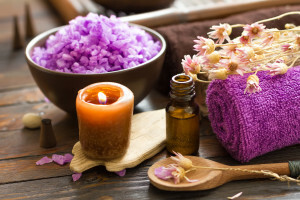 Here we’ve compiled ten of our favorite and most popular types of massage that equip the use of different techniques that are suitable to your needs. So lay back, clear your mind, and exhale.